Last summer, the thought weighing on most people’s minds was the horrific BP oil leak and what could be done to put a stop to it. Appropriately enough, months later, oil spill cleanup app games are popping up. 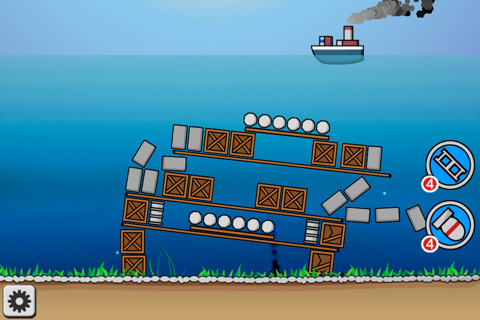 Boom Boat is the second gaming app I have seen that is based on cleaning or mending an oil spill. Instead of fighting off a soldier, or a wild mythical beast, or a flock of enraged birds with special powers, the enemy is oil that is polluting precious water sources. The game was released by Robert Foor for an iPhone, iPod Touch, and iPad and costs $0.99. Boom Boat is a steamboat-looking ship that floats above damaged areas looking for oil leaks. The premise is that there is an oil crisis that is shaking the world’s economy. Major oil leaks are suddenly materializing all over the world and it is up to the Boom Boat to seek them out and stop them. Obstacles inevitably get in the way and as the levels increase, so do the challenges. The game is physics-based and draws on your ability to solve puzzles. 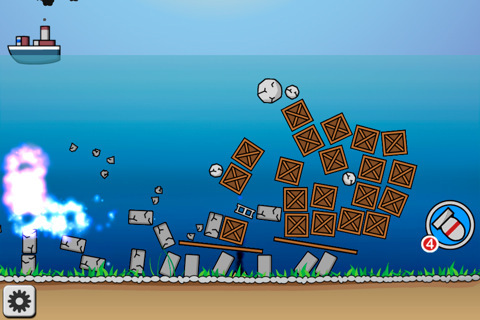 The levels begin simply enough, tilt your device until the boat is hovering over the damaged site and then release a bomb that will float down and detonate on the ocean floor, putting a stop to the flowing oil. There are a limited number of bombs you get to use, so each one has to count. Other than bomb conservancy, another challenge is to use the obstacles built up around the oil leak to try to plug the spill, which is where using physics comes into play. There are 30 levels and you get the option of getting 1-3 stars per level based on how well or poorly you play. In the world of physics-based games, Boom Boat is elementary. Nonetheless, I had a good time playing around with it before the novelty wore off. At its hardest, it is moderately challenging and there is always the bottom line: Putting a stop to the evil waves of oil streaming into the world’s water supply. AppSafari review of Boom Boat was written by Vanessa Paszterko on January 31st, 2011 and categorized under App Store, Games, Physics Based, Puzzler. Page viewed 3611 times, 2 so far today. Need help on using these apps? Please read the Help Page.